Hey, I finally figured out how to type an "ñ!" El Pequeño is one of those "background characters." I don't really have any plans for him; I just liked the idea of a guy who looks kind of like Robin, only with his outfit the colors of the Mexican flag. Someday I'll have to tackle the issue of whether he actual has magical shrinking powers, or if he's just completely delusional. 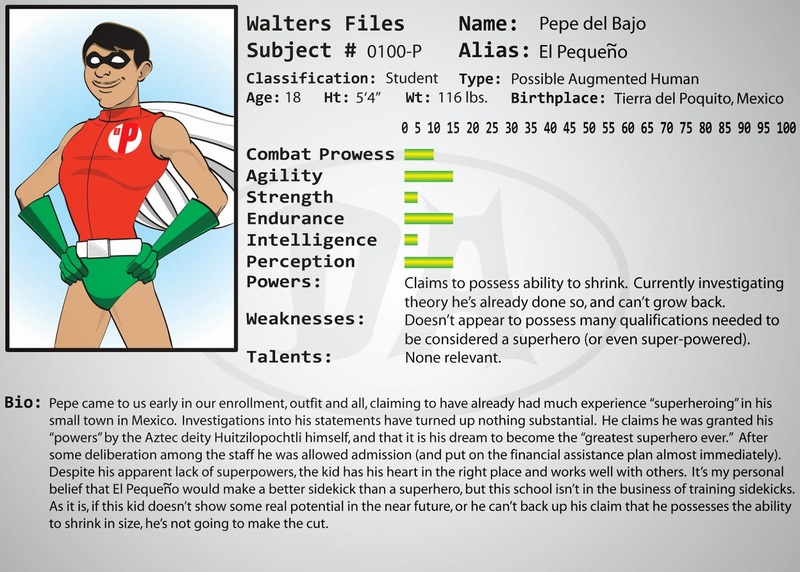 El Pequeño comes from the RPG I ran that began all of this. If I remember correctly, in that game he actually became one of the PC's sidekicks, and together after graduation they ended up being a part of the new Fantastic Four (or maybe it was Five, I don't recall).